This is the best premium-compact crossover for you if you believe subtlety and speed can work in harmony. 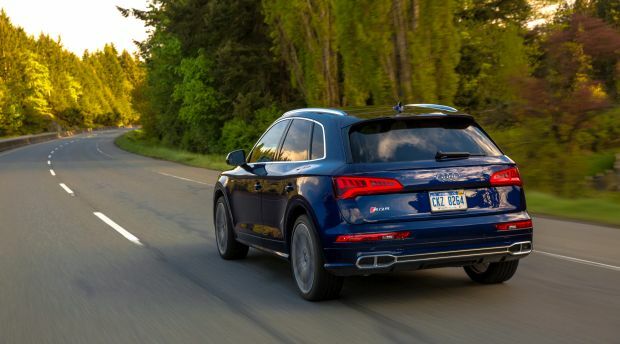 This review covers the Audi SQ5, the high-performance version of the German automaker’s Q5 crossover. Audi was among the first to introduce a small, upscale SUV when it launched the Q5 for model-year 2009. Classy exterior styling, an interior that wouldn’t look out of place in the brand’s flagship A8 sedan, and fine all-around performance propelled the upscale five-seater to sales success. The SQ5 debuted for model-year 2014 with a supercharged V-6 engine producing 354 horsepower. This model hid its talent well, with only very minor trim differences to distinguish it from its more mainstream Q5 siblings. The formula has been successful enough to encourage rivals BMW, Jaguar, Mercedes-Benz, and Porsche to introduce their own sporty small crossovers. Model-year 2018 marks the premiere of the second-generation Q5 and SQ5. Both are built on a new underskin structure and have fresh styling and content updates, along with refinements to the driving experience. The redesign has been a boon to sales. Audi doesn’t separate SQ5 numbers, but sales of the overall Q5 lineup are up nearly 25 percent during the first quarter of 2018. 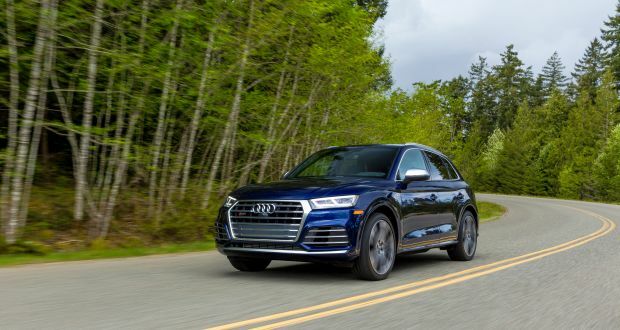 That’s not quite enough to dethrone the Cadillac XT5 and Mercedes-Benz GLC from sales leadership in the segment, but Audi tends not to incentivize its vehicles heavily. That could affect new-vehicle sales but it also improves brand perception and resale values. It might be worth waiting for the 2019 model to see whether Audi expands availability of key driver-assistance features to the entire SQ5 line, rather than including them only as part of a $1,800 option package on the most expensive trim level. If that doesn’t concern you, check out the ’18. The redesigned SQ5 looks subtly different than its predecessor but chassis and interior have been improved to make the driving experience more enjoyable. 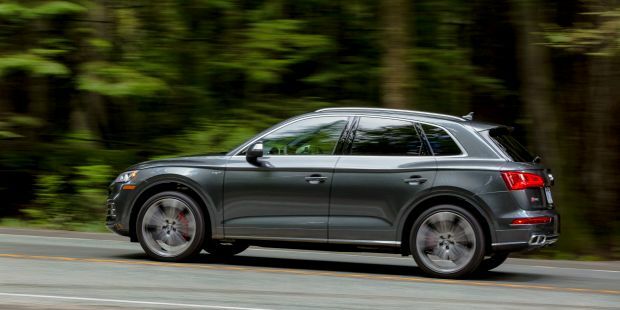 The SQ5 comes in Premium Plus and flagship Prestige trim levels, both with automatic transmission, 20-inch wheels, and Audi’s laudable quattro all-wheel drive (AWD). Styling: As with the volume-selling Q5, Audi updated the look of the SQ5 as part of the model-year ’18 redesign. The biggest change comes at the front, which adopts a more angular fascia than the 2009-2017 edition. The hexagonal grille with horizontal bars and prominent Audi emblem is the new face of the brand; you’ll see on other Audi’s, including the upcoming 2019 A6 and A8 sedans. The cut lines across the doors have more definition, as do the taillights. The SQ5’s interior sees more dramatic changes for 2018. It includes a redesigned flat-bottom steering wheel that surrounds a revamped instrument panel. The Premium Plus has an Audi-typical gauge cluster that’s easy to negotiate. Optional on this model and standard on the Prestige is Audi’s Virtual Cockpit, which supplants traditional needles and dials with a single, high-resolution 12.3-inch LCD screen. It can be customized to show “regular” gauges, music playlists, and even a redundant navigation display. Unique to the SQ5 is a “Sport” configuration that places a tachometer at the center with a digital speed readout inside. We like this setting the best because it keeps key information dead ahead while still allowing for the display of audio or navigation data that can be easily read at a glance. The Prestige model’s head-up instrument display can show a variety of data, but it washes out when wearing polarized sunglasses, so we keep it switched off. All models support Apple CarPlay and Google Android Auto, and those with navigation include an 8-inch display (up from 7 inches) and Audi’s MMI interface for audio, GPS, and vehicle settings. The infotainment screen sits atop the dashboard and is governed by a dial and laptop computer style touchpad. It works extremely well for most tasks, and kudos to the engineers for cleverly incorporating radio station preset controls into the touchpad. Said touchpad is a rather clever solution for entering navigation information or searching for songs on a connected smartphone/audio player because it supports handwriting recognition. You trace the first few letters of a song, and the system will be able to call it up right away. It can be faster than using the scroll wheel to navigate folders, especially on devices that contain a lot of files. On the downside, Q5’s lack of a touchscreen makes navigating the CarPlay or Android Auto interface a bit clunky. As expected from an Audi, interior materials quality is near faultless. Standard brushed aluminum inlays on the dashboard and doors look and feel classy, while the optional carbon fiber replacements add extra sportiness. The standard upholstery is a blend of leather and Alcantara faux suede that makes the interior feel far more expensive than it is. Full leather seating surfaces are optional, as are upgraded Nappa-brand hides that include diamond-quilted stitching, reminiscent of what you might find in a Bentley, the ultra-high-end British automaker that is a part of the same group as Volkswagen, Audi, and Porsche. Regardless of which upholstery you choose, you will find aggressively bolstered front bucket seats. Larger folks might find them a bit confining. Those longer of leg will appreciate the adjustable thigh support. The rear seat is not quite as comfortable as we would like, mostly on account of a very firm cushion. Headroom is not an issue in either seating row, even beneath the housing of the standard panoramic sunroof. Audi gives you the option of removing the sunroof; it won’t cost you extra, but they don’t give you a credit for doing so. Visibility is OK to the sides, but a small rearview mirror and tall rear-seat headrests compromise the view directly aft. Cargo volume is class average at 26.8 cubic feet with the rear seatbacks up and 60.4 with them folded. More interior storage would be nice as the center console is rather small. Mechanical: The heart of the SQ5 is a 3.0-liter turbocharged V-6 that produces 354 horsepower and 369 pound-feet of torque. That output is actually conservative among performance-focused premium compact crossovers: the rival X3 M40i has 355 horsepower, the F-Pace S has 380, the GLC43 has 362, the Porsche Macan S has 360. Neither is the SQ5 particularly light in this company, with a curb weight of 4,398 pounds. So at 5.1 seconds 0-60 mph, it isn’t the quickest among its peers, the fastest of which are a half-second faster. Still, you’ll not want for performance and the quattro AWD and crisp-shifting 8-speed automatic transmission team nicely to put power to pavement. For best performance, set the standard Audi Drive Select to “Dynamic.” This quickens throttle response and, if equipped with the optional Dynamic Steering system, steering response, too. It also alters transmission shift points, adds a more aggressive sound to the exhaust, and firms up the suspension on models equipped with the optional adaptive damping system. Audi’s well-balanced quattro system makes the SQ5 a delight to toss into sweeping turns, especially in Dynamic mode. The extra sound from the exhaust is a delight to the ears during acceleration, as is the popping that occurs when the transmission changes gears. These seem like small touches, but they go a long way toward keeping the driver engaged. The “Comfort” setting, which is supposed to be for everyday driving, dulls steering, throttle, and suspension response a bit too much for our liking. It makes the crossover feel a bit less confident than it really is. We kept the SQ5 in Dynamic for most of our evaluation period because it was more enjoyable to drive. Further, it did not take a drastic toll on ride quality, despite our test example having the adaptive suspension and optional 21-inch wheels on three-season performance tires. The ride is somewhat firm regardless of suspension setting, but it’s not uncomfortable. Features: The SQ5 Premium Plus comes with a nice array of standard amenities, including full LED headlights and taillights, 20-inch wheels on summer performance tires, panoramic sunroof, leather upholstery, heated front sport seats with 12-way power adjustment and two-position memory for the driver, three-zone automatic climate control, hands-free power rear liftgate, Audi connect CARE telematics, CarPlay, Android Auto, two SD Card slots for playing your own music files, and a 180-watt 10-speaker audio system. On the safety front, all SQ5 models include blind-spot alert with rear cross-traffic detection and autonomous emergency braking that can bring the vehicle to a stop to avoid rear-ending the car in front of you. Prestige grades add front- and rear-obstacle detection, top-view camera, imbedded navigation, Audi Virtual Cockpit, a trial subscription to Audi connect PRIME and PLUS online services, surround-view camera, and a 19-speaker, 755-watt Bang & Olufsen audio system. Good news on the base-price front: the trend equal to or slightly below those of high-performance rivals. Including Audi’s $975 destination fee, the 2018 Audi SQ5 Premium Plus starts at $55,275 and the Prestiage at $59,475. Any paint color except for “Ibis White” or “Brilliant Black” is an extra $575. Carbon fiber inlays are $500 while 21-inch wheels are $1,000. You can substitute all-season tires on the standard 20-inch rims for no charge. Side-impact airbags for outboard rear-seat occupants are $350. You can equip a Premium Plus with the Prestige’s Virtual Cockpit and imbedded navigation system for $2,600 and its Bang & Olufsen audio for $950. Most options and packages are available on both trim levels. There’s the $500 Cold Weather Package that includes heated outboard rear seats and steering wheel. The $1,200 Warm Weather Package adds upgraded “Milano” leather upholstery, ventilated front seats, leatherette center console and door arm rests, and rear side-windows sunshades. Nappa-branded seating surfaces are $1,250, but you can’t order them with the Warm Weather Package. The $3,000 S sport Package nets red brake calipers, sport-tuned adaptive air suspension, and a sport-biased rear differential. An SQ5 with the S sport Package can also add Audi’s Dynamic Steering for another $1,150. Exclusive to the Prestige is the $1,800 Driver Assistance Package, which adds radar cruise control, lane-departure warning with automatic steering correction, automatic high-beam headlights, and traffic sign recognition. It isn’t cheap, but at $68,600, a Prestige model with every option except the Warm Weather Package and 21-inch wheels is our top pick. The adaptive sport suspension, dynamic steering, and Audi Drive Select are the best ways to get the most out of this speedy small crossover. The SQ5’s EPA ratings are not bad for the power on tap, but they’re not great either, at 19/24/21 mpg city/highway/combined. With our test example in Dynamic mode most of the time, and after more than a few quick getaways from a stop, we averaged 21.0 mpg. Premium-grade 91-octane fuel is required. Likely not much since 2018 is the inaugural year of the second-generation SQ5. We hope Audi will see fit to equip the currently optional driver assistance features as standard across the board, or at least make the package available on the Premium Plus. A major update to styling and/or powertrain is unlikely before model-year 2021 or 2022.